The National Operations Center of Excellence brought five students looking to start a career in transportation systems management and operations or TSMO to the 2019 Transportation Research Board’s annual meeting last week in Washington, D.C. The trip was part of a yearly competition that rewards winners with free travel to the TRB meeting, where they participated in discussions and one-on-one meetings with TSMO industry leaders. The NOCoE is a partnership of the American Association of State Highway and Transportation Officials, the Institute of Transportation Engineers, and the Intelligent Transportation Society of America, with support from the Federal Highway Administration. Unlike other more established transportation disciplines, TSMO has lacked an institutional support structure/centralized home for collecting and disseminating best practice information and identifying research needs and capabilities – a role the NOCoE is deigned to fulfill. 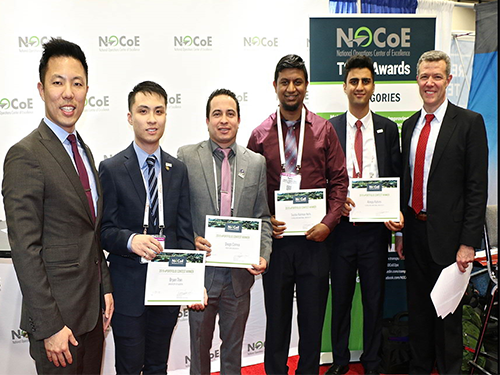 NOCoE said that this annual competition – now in its third year – requires students to submit an ePortfolio to demonstrate their desire to work in the TSMO industry and to demonstrate their communications and creativity skills to prospective employers. The group added that entrants develop and/or update their ePortfolios to ensure they clearly demonstrate an interest in TSMO while showcasing their academic or professional experience relevant to a potential TSMO position. NOCoE added that experience outside of transportation and engineering – including communications, data science, economics, along with many other disciplines – can be included in the ePortfolios being submitted for this competition.